While in Cabo, our posse of five rolls into a truly authentic Tortilleria on old San Jose del Cabo. So authentic in fact, our college sophomore level of Spanish doesn't get us past pollo, bisteca, and camaron. The entire place is inhabited by only locals except for us. We love authentic cuisine and sought out a place recommended to us and when we came across this joint, oh, even better. Since we were going to end up with who knows what on plates, I did seek the help of two American ex-pats and we end up ordering some of the best food we ate in Mexico. With the fifteen plates brought to our tables (those boys were hun-gry) came a bowl of peppers. You don't need to be fluent in la lingua to know peppers are peppers and if they have been soaking in some Mexican au jus, you better proceed with caution. We love the spicy, so no one is afraid to test the waters. Now, JohnnyMac already had a bit of dispute with a pepper on a previous night, and sweat was almost coming out of his eyeballs. The RevDoc chomped down on the same pepper like he was eating a tootsie pop. Barely raised an eyebrow. So JohnnyMac is all set to test from the bowl of jalapenos, cayennes, serranos, and a few mystery peppers. He plays pepper roulette and takes a bite. We all do. 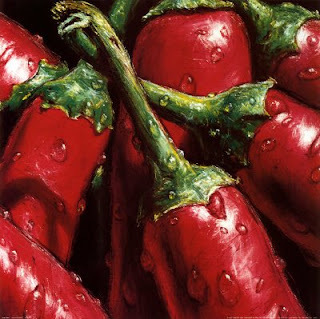 Its probably a serrano which you may know has significantly more capsaicin than your average jalapeno. So on the "Oooooo that's hot" scale (aka Scoville), Serrano will hurt your feelings if you try to be too sassy. And even if you are the world's best pepper eater, and you love spicy food, and you can eat anything, careful, these peppers are not comparable to what you might purchase at your local Publix grocery. With a few burning, stinging tongues, we enjoy our meal and as JohnnyMac dips back in the bowl of fire, I remind him that no part of his fingers shall touch our precious child's face, arms, legs, or hands. I say this because our son wants nothing more than to sit on Daddy's lap. JohnnyMac mildly scoffs at me as if I need a reminder he didn't just become a Daddy on the way to the Tortilleria. Now note, when I told The Bean this story, she asked me if perchance JohnnyMac had been drinking all day and forgot what he was doing? Intoxicated? No. Confused? No. So we watch as JohnnyMac turns eight shades of I-yi-yi-yi-yi because he has peppered up his peeper. My oh MY, the jokes we launched at him couldn't come fast enough. His poor midsection was contorting like a Mexican version of Cirque du Ole' and once I knew it wouldn't fall off, I could do nothing more than laugh laugh laugh laugh laugh. I'm so sorry for laughing. I once wiped my eyes while on the phone and chopping peppers and therefor distracted. My eyes still sting at the thought of it. The sink outside the bathroom IS a great idea though. You really must have been in an authentic restaurant. That is Hilarious! You truly have a way with words!! Love your blog and am a follower! LOVE your blog and your wit! This story, now that it's over!, was great!